A friend lends you his car. It is very noisy and blows a lot of smoke. He tells you the vehicle has been given a defect notice but it's still OK to drive it. What should you do? A friend lends you his car. It is very noisy and blows a lot of smoke. He tells you the vehicle has been given a defect notice but it's still OK to drive it. What should you do? A. Borrow the car but only drive on streets where the car will not be a danger to others. B. Borrow the car, but always drive it 10 Km/h below the speed limit. C. Before you borrow the car check the defect notice to make sure it is legal to drive the car. Correct. A defect notice will be issued for a failed inspection and a vehicle will not pass a subsequent inspection until the necessary repairs specified on the defect notice have been fixed. In the case of a minor defect notice there will be a time period specified in which the defects must be fixed. For a major defect, the vehicle might be grounded (prevented from driving on the road). There are fines for driving a noisy or smoky vehicle. Starting or driving a vehicle causing unnecessary noise or smoke carries a $311 fine and 3 points on your licence. 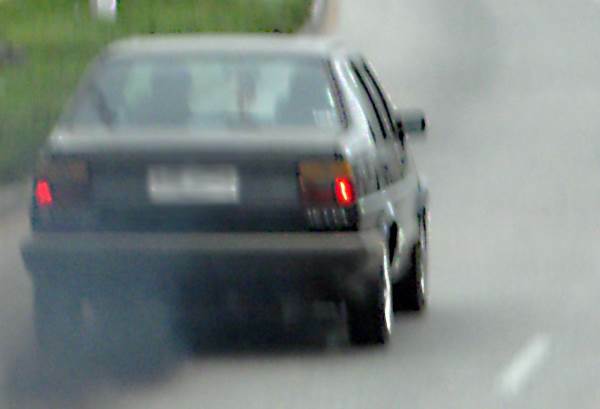 Smoky vehicles are vehicles that cause a lot of unnecessary air pollution. This accumulates in the air and affects people's health and contributes to smog which reduces visibility as well as damaging certain types of buildings as it can cause acid rain. Air pollution is said to cause over 3.6 million deaths per year. Noisy vehicles are an annoyance to other people. An excessively noisy vehicle usually means that there's a problem with the muffler. If your vehicle has suddenly become noisy then you might have a hole in the muffler. If the muffler is still in generally good condition you can usually have the hole or crack welded quite cheaply. If you undertake basic maintenance for your car then you'll reduce the chances of it becoming smoky. For causes of visible exhaust fumes see here.